Home Current Affairs	Google Currency Converter faced glitch, showed miscalculations in Pakistani Rupees. 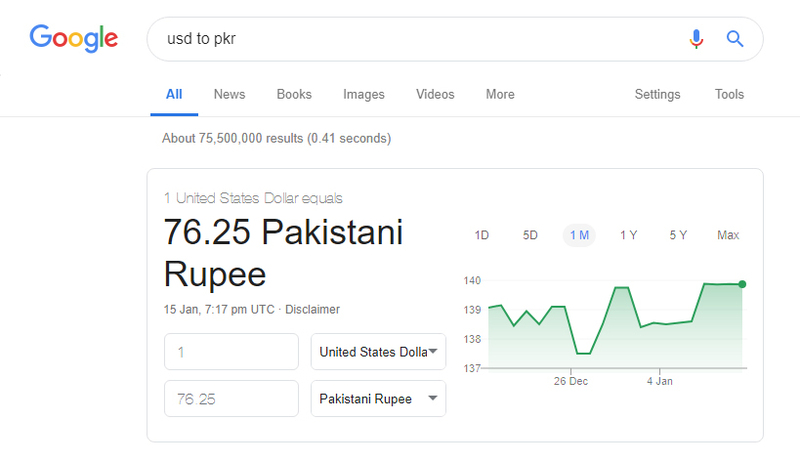 Google Online Currency converter faced glitch. Due to temporary technical errors, the converter was showing miscalculations. The glitch resulted in a trend on social media. Reportedly, on Tuesday night Google currency converter showed miscalculations. The currency conversion error observed with Pakistani currency only. The converter showed error with various conversions i.e USD to PKR with the raise of 76.25 PKR,1 EURO equivalent to 87.01 PKR, 1 Dirham UAE equivalent to 20.76 PKR and 20.33 PKR equivalent to 1 Saudi Riyal. This mind boggling glitch just created a trend of memes on the social media. And the trail of memes started hitting the social media from Tuesday till Wednesday until it was sorted out. After tremendous amount of memes and reactions Google fixed the error and dollar went back to its peak i.e 1 USD equivalent to 139.88 PKR.